This is not Star trek!!! Discussion in 'Star Trek: Discovery' started by deckard1, Mar 22, 2019. So your very first post at the TrekBBS is a nonsense complaint? BTW, welcome to the TrekBBS. saladdays, NewHeavensNewEarth, The Wormhole and 6 others like this. You registered just to post this? Epic failure. saladdays, NewHeavensNewEarth, The Wormhole and 8 others like this. I gave up when Spock assaulted his Captain. And then I gave up again when he assaulted his Captain for a second time. By the third time I was gone for good. BeatleJWOL, StametsFungi, saladdays and 19 others like this. Okay, bye. Don’t let the door hit you on the way out. saladdays, The Wormhole, PiotrB and 11 others like this. I'm a huge fan of Section 31 but I love that scene. Why would this of all things make you want to stop watching? There are plenty of "better" moments to choose from... so I think you don't actually believe what you're saying and just want a reaction. Ovation and Turtletrekker like this. His father was a Section 31 officer and was punched to death on the OP's birthday. StametsFungi, The Wormhole, PiotrB and 7 others like this. Here's that attention you ordered. BeatleJWOL, The Wormhole, CommanderRaytas and 2 others like this. CommanderRaytas, Turtletrekker and Lord Garth like this. It says "Star Trek" on the box; it's "Star Trek." Something can be "Star Trek" and not be good. * It's a brand. *This late in the day, in fact, that's the way to bet. BillJ and GNDN18 like this. I have nothing to add, really. I just love this scene. The Wormhole, CommanderRaytas, XCV330 and 4 others like this. 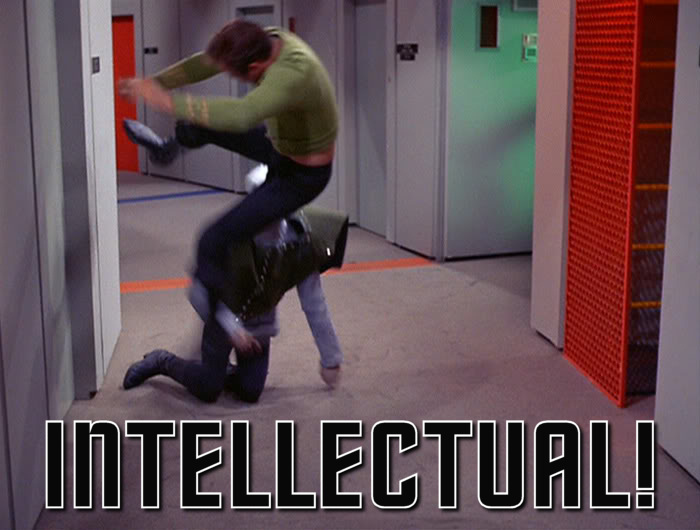 Kirk's wanted to beat the tar out of some bozo or other ever since the academy. CommanderRaytas and GNDN18 like this. Noname Given, BeatleJWOL, The Wormhole and 11 others like this. You're at least 23 years too late for that. Unless there's some key difference between a distraught Burnham decking Leland and a furious Worf punching the Klingon lawyer in his trial in Rules of Engagement that I'm not seeing. And if you're scandalized by a Section 31 operative being punched by one of our heroes, you'll faint when you see what they do to one in Extreme Measures. The Wormhole, CommanderRaytas, Hythlodeus and 3 others like this. Aren't Good-Bye Posts against the rules? I'm assuming the point is that Burnham attacked a superior officer, but I'm not sure how the chain of command works with this new Section 31 approach. She's more like Spock, than I thought. PiotrB, GNDN18, Hythlodeus and 2 others like this. Well, if Michael’s in the brig, who's going to save every sentient lifeform in the galaxy? Bgt, BillJ, saddestmoon and 1 other person like this.